If you have any questions or want to enquire about dates, use our form to contact Julia Martin or see their website for more information. Follow the winding road, past Connemara ponies and rare-breed sheep, to a farm that’s been here for centuries. Julia’s natural warmth, and the Dartmoor views, will soothe ruffled souls. Hop up the granary’s exterior steps to your room: white walls and wood floor, curvaceous French bed, sky windows for gazing at glittering stars, and a delicious French antique double-ended bath, basin and loo behind a screen. There’s another beautiful bath in a tent (shared with two yurts), and your own garden with a firepit. The communal Loft has a fridge, kettle and toaster, comfy armchairs, church pews and trestle tables for wholesome breakfasts and suppers. Continental breakfast included. Cooked breakfast £8. Dinner, 2 courses, from £12. Pubs/restaurants 4 miles. Had such a lovely break away from London in the peaceful Devon countryside! The room was clean and tidy, and had lots of little touches that made our stay even more special! We absolutely loved the bath in the room and want to thank Julia for our delicious homemade breakfast eggs from the farm too! Would definitely recommend to anyone who needs a little retreat! It was such a lovely stay in the Granary for me and my Girlfriend. We felt so welcomed and the breakfast was amazing. So good to be able to meet all the animals, Archie the Labrador was definitely the favourite one. We will hopefully be back soon for another stay! Absolutely a fantastic place to stay! 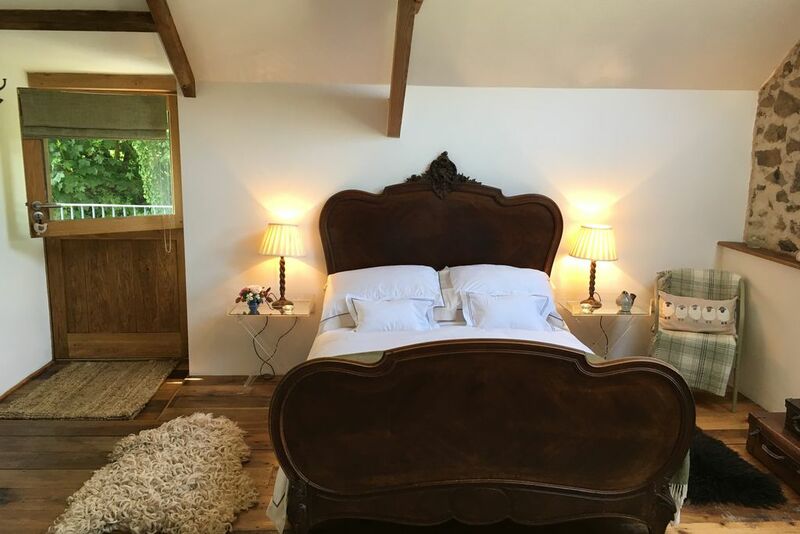 The views from the room are breathtaking and the Granary is a perfect retreat if you want to relax and unwind or to get out and about and explore the beautiful countryside here. Julia has been a fantastic host and breakfasts here are awesome! My little girl loved waking up and helping feed the ponies and searching for freshly laid eggs. We won't forget this magical place and will be back again! What an amazing place to stay! A perfect retreat to get away to relax and unwind or to get out and active and discover the dramatic dartmoor countryside. The granary has the most fantastic views and the room has lots of lovely little finishing touches. The breakfasts are awesome and Julia has been the perfect host. My little girl loved waking up in the morning and helping feed the ponies and search for eggs! We cant wait to come back again! A lovely little get away in the Devon country side. Julia was a great host, and so were all the animals! Loved Archie the dog and Aussie the cat. Plenty of places to go for dinner around there too which is really great. Looking forward to hopefully getting down there next summer again. National Trust Lydford Gorge - amble through the spectacular gorge in the beautiful village of Lydford on the edge of Dartmoor. See the white lady waterfall, paddle in the stream or have an ice-cream whilst soaking up the beauty of the river bank. Picturesque ancient stannary town Tavistock - won best market town award with its quirky pannier market, coffee shops, independent shops and parks. Also home to The Cornish Arms voted nationally as a top gastro pub. Brentor Church - climb up our nearest tor at Brentor to discover a most charming church dating back to the 12th century, always open and worth a visit for its history and the cracking panoramic views from the churchyard. North Cornwall coast, take a cliff top walk at Crackington Haven, visit Boscastle and enjoy the drama of the castle at Tintagel perched high on the cliffs with crashing waves below; surf and walk the beautiful sandy beaches at Sandymouth. Eden Project - Tim Smit's vision for tropical and temperate biomes in a claypit in Cornwall is a must to visit and totally inspirational for anyone interested in plants and nature. Hotel Endsleigh - visit our closest hotel run by Alex Polizzi where you can enjoy a most fantastic cream tea sitting under canvas umbrellas on the hotel lawn with stunning views along the Tamar Valley across to Cornwall.